Empire Coin and Valuables, Large Denomination Notes. Over the years the United States has printed a number of different denominations in paper notes ranging from fractional currency (i.e. .05, .10, .25, .50 cent) all the way to the $100,000 Woodrow Wilson Gold Note. The denominations of $1, $2, $5, $10, $20, $50, and $100, are currently in circulation in the United States, however, before the Executive order from Richard Nixon in 1969 there were both $500 & $1000 Notes in circulation. The $5,000, $10,000, and $100,000 Notes were almost exclusively used for exchanges between reserve banks. There are 5 Different $500 Notes. The first was printed in 1879 and bears the likeness of Lady Justice and John Quincy Adams. The second is a gold certificate printed in 1882 and it bears the likeness of Abraham Lincoln. The third is a bill printed in 1918 bearing the likeness of the first Chief Justice John Marshall on the obverse, and a scene depicting the first European expedition into America by Hernando De Soto on the reverse. The last two notes both feature William Mckinley one was printed in 1928 and is a Gold Note, the last one is a Federal Reserve Note and was printed in 1934. There are three different types of $1000 notes, the largest note printed for common circulation. The first is a 1918 Federal Reserve Note with Alexander Hamilton. The second is a Federal Reserve Note With Grover Cleveland printed in 1928 and 1934. The last is a 1934 Gold Certificate which also bears Grover Cleveland. All three different Issues of the $5,000 Note bear James Madison on the Obverse. This is an extremely rare note as there are only 342 of them known to exist. The small size 1928 Gold Note is so rare, the only one known to exist is in the Smithsonian. The first $5,000 note was printed in 1878 and is a United States Note. The 1918 Series of the note is a Federal Reserve Note bearing a scene depicting the resignation of General Washington on the back. The last type, also a Federal Reserve Note, was printed in 1928 and 1934. 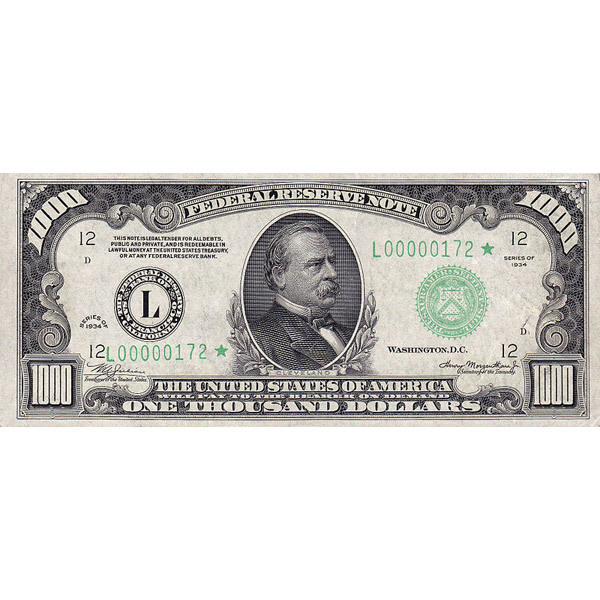 The $10,000 Note was originally printed for the exclusive use of exchange banks when they needed to move large amounts of money between themselves. The first one, the 1878 $10,000 note, is a United States Note and is known to exist in private collections. This occurred as a result of a fire in the Federal Reserve Building where in the process of putting the fire out some of the notes were removed from the building and subsequently “acquired” by onlookers, it bears the portrait of Andrew Jackson on the obverse. The second version the 1918 Series which bears Salmon P Chase on the obverse and depicts the pilgrims on the reverse. The last one is a 1934 series note that also bears Salmon P Chase. There is a single 1928 $ 10000 Gold Certificate that is on display at the Smithsonian. Government Records show that 3 Gold Certificates printed in 1934 Exist but there location is unknown. Large notes were in use to varying degrees all the way until 1969 when, by Presidential order, Richard Nixon ended their issue as a way to make it harder for organized crime to transport large sums of money.